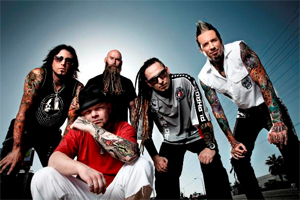 Global rock heavyweights FIVE FINGER DEATH PUNCH (5FDP)--Ivan Moody (vocals), Zoltan Bathory (guitar), Jeremy Spencer (drums), Jason Hook (guitar) and Chris Kael (bass)--who recently kicked off Fall’s biggest rock tour co-headlining North American arenas with VOLBEAT through October 24. 5FDP has teamed up with Live Nation and Yahoo to live-stream their October 11, 2014 concert live from The Arena at Gwinnett Center in Duluth, GA. This is one of 365 concerts to stream over a 12-month period on the Live Nation Channel on Yahoo Screen. Fans will also have the freedom to stream the concert wherever they are through Yahoo Screen iOS, Android, mobile Web, desktop, and Smart TV platforms including Apple TV, Roku, and Xbox 360. Since their formation in 2006, 5FDP has undoubtedly become one of the most successful rock bands and touring acts in the world with three Gold certified albums (The Way Of The Fist (2007), War Is The Answer (2009) and American Capitalist (2011)), cumulative single sales exceeding over 5 million, spawning 13 consecutive Active Rock top ten singlesincluding two #1 hits and headlining festival tours such as Mayhem in the U.S. and performing at major festivals across the world from New Zealand to Europe.